The top of this page has links to free attractions tours, such as the guided tour of the Music Center complex. The second part of the page has links to walking tours, both self-guided (free) as well as guided tours that charge a small admission fee. Olvera Street Tours - [La Plaza Park near Union Station] - Las Angelitas del Pueblo is a volunteer docent group that gives the tours of El Pueblo de Los Angeles Historical Monument, including Olvera Street and historic buildings. Advance registration is required, through the Las Angelitas website. Meet the tour guide before your tour starts, at the office of Las Angelitas del Pueblo, located on the south side of La Plaza, between Pico House and the Firehouse museum. (You can easily see the tour office from Los Angeles Street). Self-Guided Tour of Olvera Street: A self-guided tour brochure describing the historic buildings is available at the Information Desk in La Plaza or at the El Pueblo Visitors Center, located in the Sepulveda House. Free L.A. Tour - Two-hour free walking tours of downtown Los Angeles, focussing on L.A.'s history, architecture and public art. Walking routes are approximately two miles long and include many downtown landmarks such as Union Station, El Pueblo de Los Angeles, the Bradbury, Central Library and Pershing Square. There are several tours daily and there is no charge, although contributions are appreciated. Check out their website for times and meeting points. Free Guided Tours on Metro Red, Purple and Expo Line Trains - Daily tours are available. This service is offered by Metro and tours are free, although riders must provide their own TAP card and fare. Spaces are limited. Visit the link for details, or to reserve a spot on a tour. Observation Deck at City Hall - [public entrance is at 201 Main Street] - This is not a tour but it feels like one. Open to the public, Monday through Friday from 9AM to 5PM, the Observation Deck offers an outstanding view of the downtown L.A. city skyline. Admission is free, but you will need to check in at the security desk at the Main Street entrance. They will issue a visitor badge and give you a leaflet with directions to the Observation Deck on the 27th floor. You will pass through the Tom Bradley Room on the 26th floor. The walls on this level are covered with pictures of all past mayors of Los Angeles. The "room" is not an open space - instead it's a hallway that occupies the perimeter of the floor. After you are finished looking at the pictures, you will walk up a grand staircase to the Observation level on the 27th floor. Most of the level is an open space filled with chairs and a podium. It's interesting to imagine what sort of conferences or meetings might occur from this vantage point overlooking the city. You can go outside on this level and walk around the perimeter of the floor. The view is great, and there are signs to let you know what's where. There are unobstructed views of Union Station, Disney Concert Hall and other attractions in downtown L.A.
Walt Disney Concert Hall / Performing Arts Center (PACLA) - [111 South Grand Avenue] - (formerly known as the L.A. Music Center) There is a self-guided audio tour of Disney Concert Hall (most days 10AM - 2PM), and docent-led tours (usually Tuesday through Saturday at 10:30AM and 12:30PM) that include the Ahmanson, Dorothy Chandler and Mark Taper buildings as well. All tours are free for individuals or small groups. Tours can be cancelled during certain performances, so see the schedule on the PACLA tour website for availability before you go. All tours originate from the main lobby of the Disney Concert Hall. Self-guided Tour: A hand-held listening device leads you on a narrated tour through portions of Disney Concert Hall. The tour covers a fair amount of the inside of Disney Hall, but does not include the auditorium areas. Attendants will provide an audio device (free of charge) and a map. When you walk to a location on the map, you will press a corresponding number on the device, then listen to the narration. The tour also covers outside areas including a large garden with trees that were imported from various Los Angeles neighborhoods. Much of the tour covers the design and structure of the building, including comments from architects and designers. There are several views of BP Hall, where pre-performance events are held. This is an interesting tour for teens and adults, although younger children will probably get bored. You can cover it in about 60-90 minutes, if you listen to the entire narration along with the side notes. To begin the tour, see an attendant in the Disney Hall Lobby. They will ask for a picture ID to hold until you return the listening device. Walk toward the gift shop, then press 101 on the listening device, to begin the self-guided tour. Docent-led Tour: This is a more comprehensive circuit of the four buildings that comprise the Music Center complex. The tour is usually offered Tuesday through Saturday at 10:30AM and 12:30PM, starting in the Disney Hall Lobby. Reservations are not required - just meet the guide before the tour begins. Tours can be cancelled when there are performances, so be sure to check the website to check the schedule on PACLA's website. Cathedral of Our Lady of the Angels - [555 West Temple Street] - Free tours Monday through Friday at 1PM. Reservations are not required - just meet the guide at the Temple street entrance of the church, 15 minutes before the tour begins. Los Angeles Times Building - [202 West First Street] - Free public tours of the historic Times Building and the newspaper's printing facility in downtown Los Angeles are available during business hours during the week. Reservations are required and participants must be at least 8 years of age. Groups and individuals can be accommodated, and tours runs an hour in length. Call (213) 237-5757 for current tour information. Los Angeles Central Public Library - [630 W. 5th Street] - Free docent tours are given daily. Daily walk-in tours of the Central Library last approximately one hour. No reservations are necessary for groups of six or less. The tours leave from the front of the Library Store in the main lobby accessible via the Fifth Street, Hope Street, and Flower Street entrances. Tours are offered at Tuesday - Friday at 12:30PM, and Saturday at 11AM and 2PM. The library's website also has a downloadable PDF Self-Guided Tour. Docent-led Walking Tour in Downtown L.A.
L.A. Conservancy Walking Tours - Docent-led walking tours are offered on Saturdays and Sundays, featuring historic architecture in downtown Los Angeles. Reservations are suggested for all tours, but are required for some. Walk-ins are allowed for some tours. Downtown L.A. Walking Tours - Provides daily guided walking tours of Downtown Los Angeles for tourists and locals. Walk the City, go inside world-class monuments, learn the history and experience the architecture of the City of Angels! Private tours and group tours are available. Angels Walk Walking Tours Download free PDFs with descriptions of sites and maps to guide you around popular destinations on foot. Walking Guides for downtown Los Angeles include Bunker Hill, Union Station, Chinatown and Figueroa (including Staples Center, LA Convention Center, USC and Exposition Park). 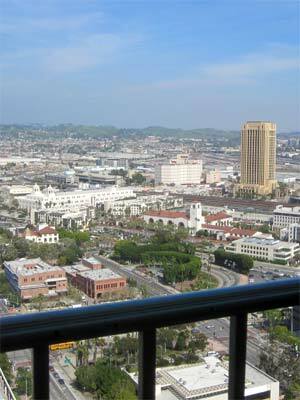 The website also offers guides for Hollywood, Wilshire Boulevard and San Pedro. Downtown L.A. Artwalk - On the first Thursday every month, art galleries and other businesses stay open late for pedestrian traffic. This is a free, self-guided walking tour located in the Historic Core district of downtown Los Angeles. You can pick up a free map at the Art Walk Lounge, located at at 634 S Spring St. Downtown L.A. Walks - Free podcast downloads and PDF maps. Print the map and listen to the narrated tour on your iPod while you walk. Arts and Culture Tour, Shopping Tour, International Tour and Historic Tour. The site has information and highlights about each district in downtown L.A. Walk n' Ride L.A. - This website describes several self-guided walking tours in downtown Los Angeles, plus provides some fascinating background and history. There are also walking tours of Hollywood, Pasadena and Long Beach. Jet Propulsion Laboratory (JPL) - [Pasadena] - Tours include a multimedia presentation about JPL, which provides an overview of the Laboratory's activities and accomplishments. Guests may also visit the Visitor Center, and various operational facilities on the campus. Space is limited and the tour is often booked months in advance. Including Disney Hall, Performing Arts Center, the Jewelry District, Little Tokyo, Olvera Street and more.